Acalypha (Chenille Firetail) is native to Hawaii and other South Pacific areas. 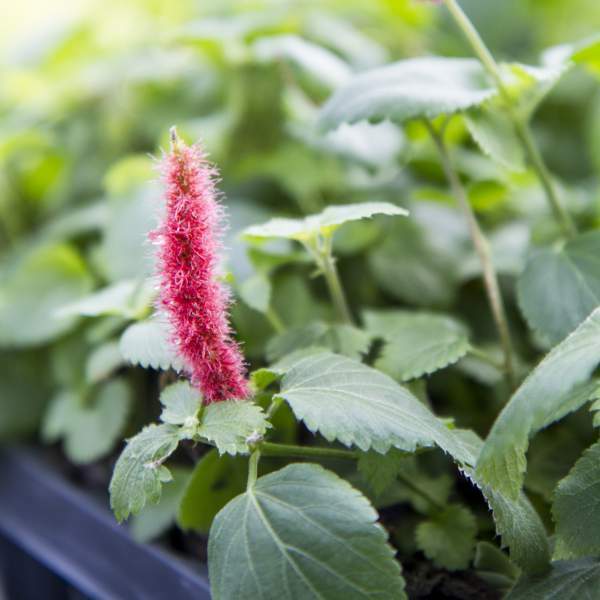 It has become very popular in recent years due to its fuzzy red catkin-style blooms, thus the common name chenille plant. A well-grown hanging basket can have dozens of these fire tails (another common name). It's an excellent choice for combination planters when mixed with other warm-weather, bright-light annuals like Coleus, Calibrachoa, and Bacopa. For best results with Chenille Firetail, start with a constant-but-low feed program of 150 ppm N and move to moderate feed (200 ppm N) as the days lengthen in the spring. If the plants develop yellowing at the tips of the leaves, pH level is the first thing to check. A pH of no more than 6 is important to prevent iron deficiency. Acalypha will naturally flower as the days get longer in the spring and will continue into the summer and fall. Chenille do not require pinching, but you can trim larger baskets to maintain their shape if you want. Allow 4-6 weeks after the last pinch for blooms to appear. Space pots as needed for pot size. Normal 2' centered spacing is usually adequate to allow air flow and penetration of light between plants. Plant growth regulators are not necessary for Chenille. Allow the plant to grow, and shape the pots through proper pinching. Whiteflies, and occasionally spider mites, are Chenille Firetail's biggest pests. Chenille are not prone to many diseases, but watch for botrytis while the days are short. This grey rot is usually associated with wet or humid conditions. You can prevent botrytis by allowing the plant to dry out between waterings, allowing for good airflow in your greenhouse, and spacing to allow the sun to penetrate to the soil level. The most common chemicals used to treat botrytis are Medallion and Banrot. Use them as a drench according to each label's instructions. We recommend planting 4 or 5 starter plants per 10 inch basket. Use a well-drained soil in your baskets and plant your starter plants deep, allowing the ellepot to be completely covered by the soil. If you are planting 4 inch pots, 1 plant per pot should be sufficient. Plant it directly in the middle of your pot.